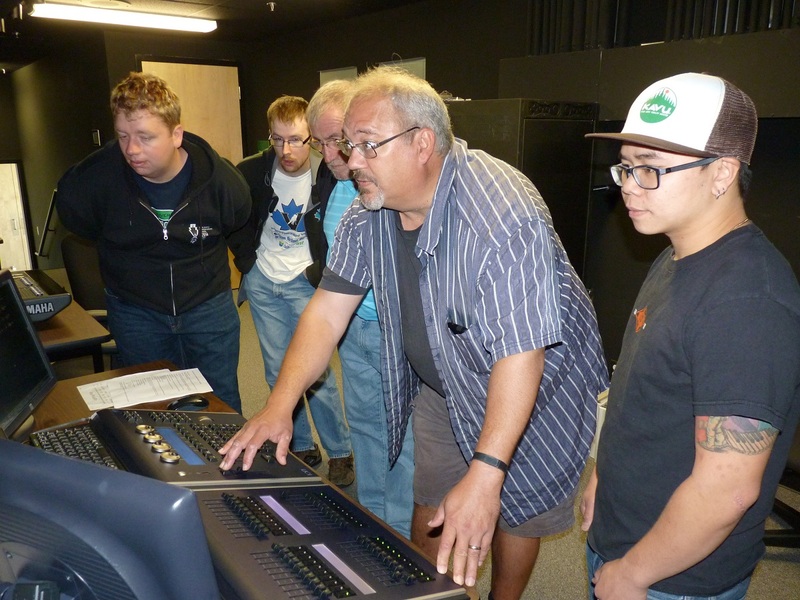 Two arts council Board members, Nathan Linders (second from right, on console, above) and Penelope Johnson, attended a technician training workshop and work party at the Frank Venables Theatre on Saturday September 27. They joined other interested volunteers from the community (left to middle): Steve, Mike, and Ron. Teaching the basics to the five stage hands were interim theatre manager Glen Cairns and theatre technician Dave Mai (pictured at right above). Glen provided an overview of the safety features in the building, including operating the fire curtain, location of fire extinguishers and first aid equipment, and exits for audiences and stage crew. 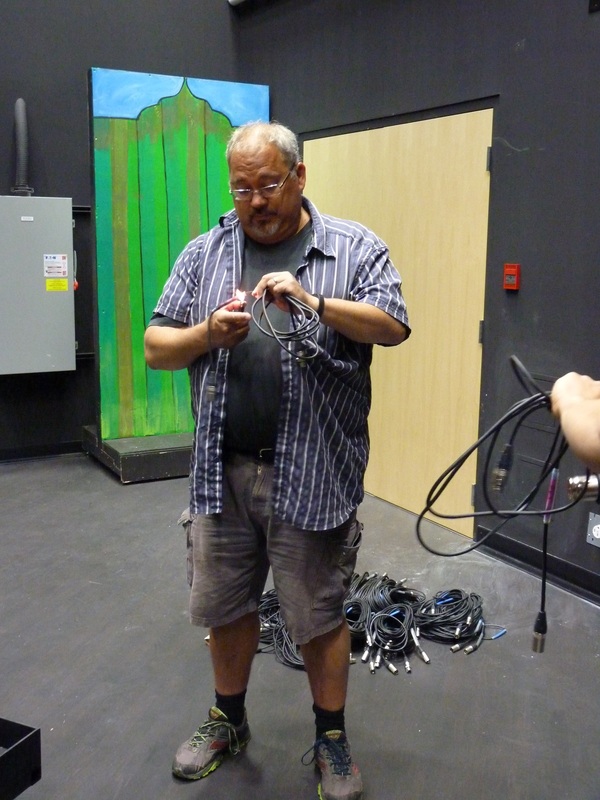 Dave Mai began with a colourful demonstration of the lighting board. With LED lights, a full colour palette is now available at the flick of a switch. The volunteers tried their hand at setting cues such as a sunset on the cyc (back wall). Dave also introduced some of the intelligent lighting system (moving heads with gobos), creating colourful visuals with motorized “spots” and patterns of light and shadow to simulate a variety of environments such as underwater eddies, a disco, or forest leaves. 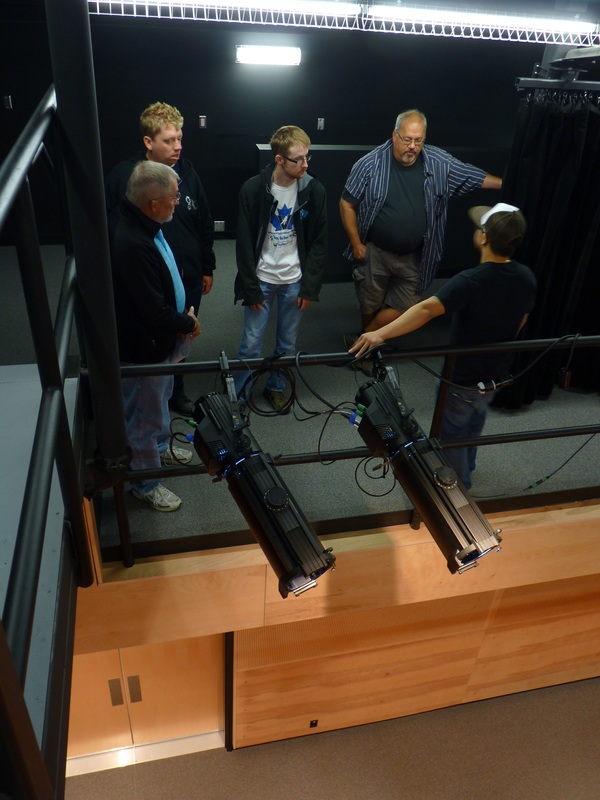 Dave continued his instruction with a tour of the catwalks above the audience (pictured above). Here the crew gained some familiarity with the two manually operated travel spots and learned how lights can be adjusted on the lighting bars. Having a head for heights came in handy! Back in the booth, Dave explained how the sound board handles everything from announcements to the foyer and backstage, to individual mics and monitors for up to 48 separate performers, to a variety of vocal and instrumental sound effects for each mic. Music, video, and sound effects can also be run through the system via laptop. 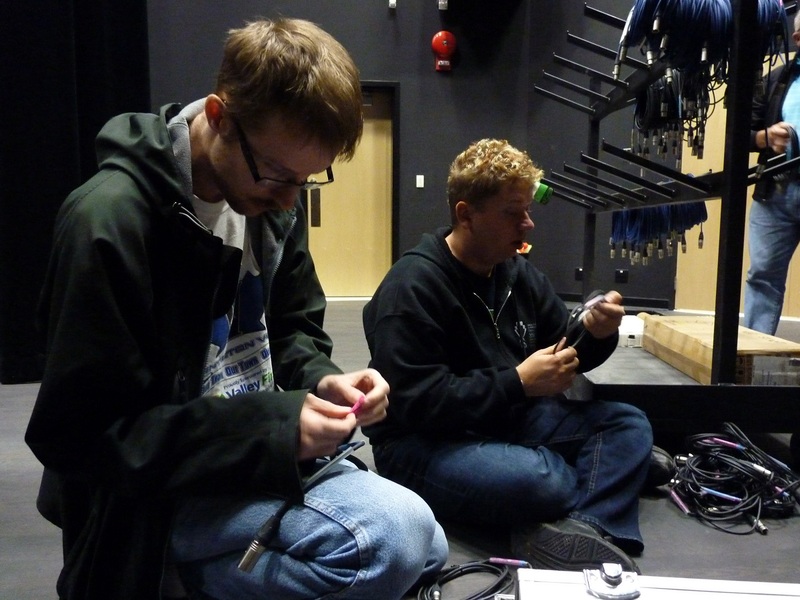 The introductory session wrapped up with a backstage work party to label the dozens of mic cables and other equipment. Above, Mike and Steve label the cords. Below, Nathan shrink wraps protective coating using the approved lighter method, while Dave commandeered the hairdryer for the same purpose.